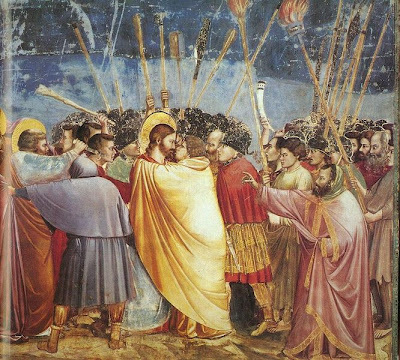 It is very hard to look honestly at Giotto’s art after reading Richard Dawkins’ “The God Delusion”. It is not hard to let yourself immerse in the frescos of the Scrovegni chapel in Padua and feel a sense of pleasure – though the emotion is perhaps better expressed as a nice engagement with image, colour, space, history, memory (for Giotto is not a new find, he’s an old friend, we’ll always have Assisi), moment – it is possible to shut out the 24 other people present, especially if being anti-“tourist” isn’t part of the aesthetic experience – and, most of all, faith. Faith, that is, in art’s capacity to mean something personally, and collectively. But it is hard after 840 brutally rational paperback pages – that’s a double read – not to question just exactly what that something might be. Just what is being transmitted to us? And is this “thing”, to use a Dawkins word, a “meme”? Even without Dawkins forceful clarity about the improbability of God, the terrible power of religion to encourage belief without reason, there is a huge gap looking at this “masterpiece of European civilisation,” as the literature has it. That gap is an understanding of the source material, that’s to say, God: alive, non-existent, Old Testament Patriarch or Great Software Designer; Jesus, son of Man, and God; or deluded first century Jewish martyr. The lacuna is religion: even if we believe in “n” something, what we’re looking at here isn’t it. Not unless we believe in a highly literal Christianity, that the word of the Bible is how it is, and was. Oh yes: people still do. The effect of the Giotto frescos in the Scrovegni chapel is a marvellous cinematic punch: an obvious observation, but nevertheless true. Wide and multi-screen, with a giant Day of Judgement on the south wall: all eyes turn to “hell” in the bottom right hand corner, because – frankly – that’s where the action is. But I keep thinking of Dawkins’ “My red is not your red, my blue, your blue…”. And the words of Giorgio Agamben, Professor of Aesthetics at Verona, the man recommended to me by Shaun, the “prodigy”, one night in Bloomsbury. Not for a minute can I feel a connection with fourteenth century visions of Heaven & Hell, grasp the early Renaissance zeitgeist; the only point I feel is that the rich Scrovegni family built the chapel to help ease their dead father’s way through Purgatory. He was a usurer, and was going to have to pay his debts before rising up to Heaven. It sounds so stupid, doesn’t it? And it led to this magnificent giant spectacle of “meaning”. On the other hand I can place Giotto on a page with Cimabue; can chart his influence on Raphael, Michelangelo, Mantegna…I can know about the market value of Giotto’s; and which museums own some. Dawkins makes the point that artists have always had to make money, and the church, and religious scenes, was the only patron and the only subject for painters and sculptors in the middle ages and most of the Renaissance. And they believed. People did. And so these geniuses painted biblical scenes, and took their money. But what, Dawkins wonders, if it had been the Scientists who had the money? What if Copernicus or Galileo, or Cremonini had been the Patrons, not another Pope? Perhaps in a parallel universe that is the case. Because we can’t understand what these paintings meant, or the emotions or intellectual feelings they induced; their traditional function to transmit a message in fifteenth century Italy. Not clearly. Suddenly I feel close to Tom Coryat, copying out his Latin texts, noting down, collecting without purchase: as we do today with Leica and Sony, seeing but not. Every sign and signifier and symbol and allegory can be studied, of course: but not standing in the Scrovegni chapel: here we have 20 minutes, and most of the work is still too far away. Here we are consuming just to consume. It’s not all bad: I leave uplifted, but confused. It doesn’t help. Yes, that’s just what I meant to say. Good man, this Agamben. Dawkins too.